Preheat oven to 375° F. Spread olive oil in bottom of 9x13 glass baking dish. In a small bowl, mix minced onions, chili powder, salt, garlic powder, cumin, and cayenne pepper. Sprinkle seasoning mixture on both sides of chicken, and place chicken into dish. 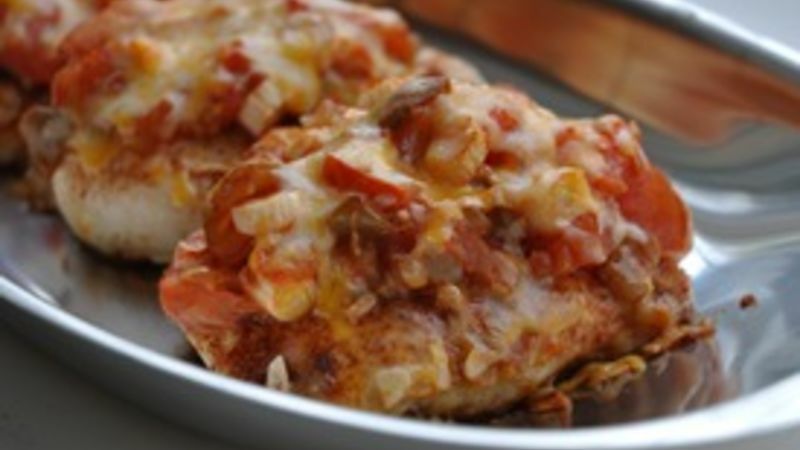 Spoon 1/4 cup of salsa over each chicken breast. Bake chicken at 375° F for 25 to 35 minutes, until chicken is done throughout and juices run clear. Remove pan from oven. Sprinkle chicken evenly with cheese. Return pan to oven and bake and additional 5 minutes, until cheese is melted and bubbly. Top each chicken breast with 1 tbsp sour cream if desired. Serve immediately.